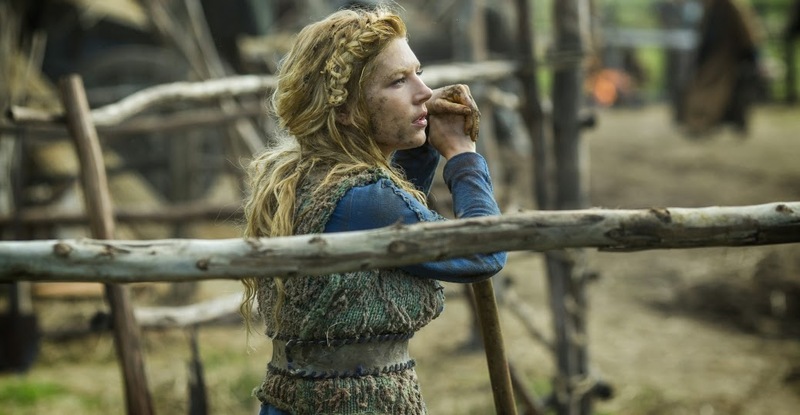 The second episode of Vikings is a bit disturbing when it comes to different areas of myth. The Wanderer is an episode of mysterious things. What I like about this episode is that we see more difference in the Viking and christian world. Funny about the episode is that it is about language barriers and barriers between gods. If we look at what happens between characters it will be easier to explain. Ragnar wanted to know from princess Kwindreth why she hated her uncle so much. something happened at the age of 6. She doesn't believe that her uncle is finally dead. After this they will try to attack the brother of princess Kwindreth but he and his army are already scared before they are even ashore. They will wait for reinforcement of the army. Aethelwolf will go and find out where they are hiding and I don't know but he can betrayal Ragnar and Kwindreth. Also we see the first boundaries in the language difference. Rollo and Thorsten with princess Kwindreth. Lagertha, King Eckbert and our interpreter Athelstan. Both old English and old Nordic language. Thorsten his arm is hurt by an arrow. He is in a lot of pain. What Rollo is doing in that next scene is trying to tell Thorsten there is a way to get rid of his pain. The leg of the English soldier isn't hurting but despite the leg position is very wrong in a way when Rollo see this he want to find out if it is possible to amputate this leg, because the men don't understand what is happening Rollo decide to kill the men. He shows Thorsten what he could do. it will make the choice easier for Thorsten. Also there is a complete trust issue going on. why does Ragnar tells Aethelwolf to go and find the army of the brother of princess Kwindreth? does he again knows the betrayal or was it planned again. Also the friendship between Lagertha and King Eckbert is going on in strange mysterious ways. First the land then the necklace where is he up to? Then we have Kalf who claims the title earl he acts like Napoleon. What is his mission in this story I still havent figure that out yet. If the dream of him will come true he will be dinner for Ragnar. what Kalfs seeks is fame. Athelstan still love both gods. He tells king Eckbert and princess Judith about it that the difference between both gods make him disbelieve in everything he thought he knew. Then we have The Wanderer at the end of the episode he is kind of mysterious and in a way before we see the face I was thinking it was Floki. Wrong but in a way I could be right also. If Floki was Loki he could change in almost everyone and with that said I wanted to go further with my believe it is the start of the myth Baldr's/Gangerli (Beowulf)/Kvasir/Alvíssmál story or the poem in the poetic/prose Edda. The Wanderer could mean a lot we know different stories in the Nordic mythology. If we think about the Wanderer it could be Odin himself (Alvíssmál, Gangerli) , it could be Loki (Baldr). It could mean that times are changing or an empire that falls. Even though we don't know much about the Wanderer we do know that he maybe attack the seer, he first only appears in the dreams of Helga, Siggy and Auslaug. Auslaug should know what will happen but she doesn't. It is tricky in lot of ways. When he truly arrives he shows up by Helga who seems afraid for him. When he arrives Athelstan his hands bleed also.